The Asian Longhorned Beetle (ALB), Anoplophora glabripennis, is another local invasive species. Native to China and Korea, the ALBs are much like the destructive EABs. Much like the EABs, the ALBs are destructing our forests. These beetles are found all over the continental U.S. and Canada (see map). Unlike the EABs, they target not only Ash trees, but also Maple, Boxelder, Elm, Willow, Buckeyes, and more. Check out the whole list here. Again, like the EABs, they are destroying the inner tissue of its host tree by tunneling and feeding. Frass, a sawdust-like material, can be found at the trunk of the tree from its burrowing. 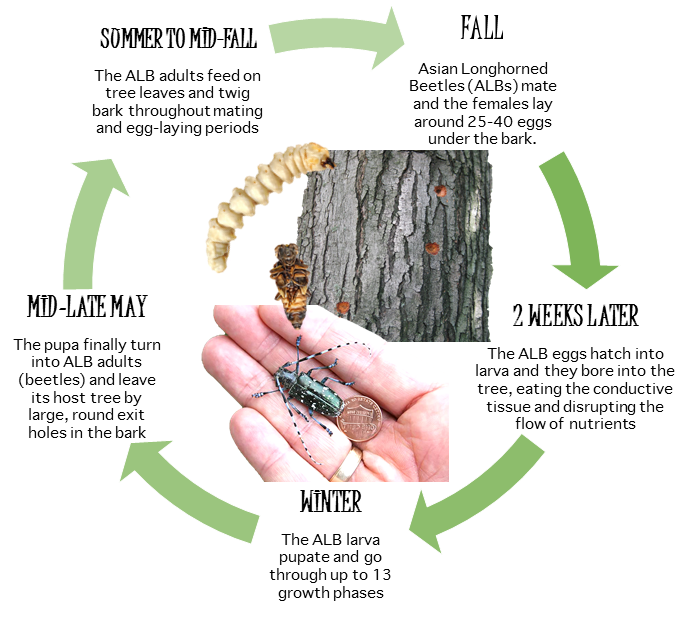 Unlike EABs, ALBs can take up to 10-15 years before killing its host tree. The ALB invasion is so bad in some areas, their materials are being quarantined. A local example is Clermont County, OH, along with Batavia and Monroe Townships. Other examples include New York and Massachusetts. So far, there is no cure for the ALB invasion. What you can do is report it when you see it. Report it here and with your County Extension. Click here for Boone's! If you can, grab a jar to collect the suspected ALB and freeze it for easy identification.